This week’s Get Jiggy Weight Loss JigSaw Puzzle, “hot biscuits here,” gives pause for thought. Will you or won’t you? 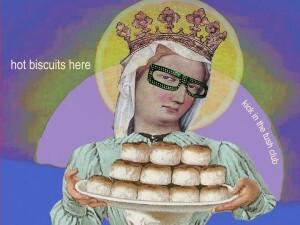 A word to the wise from Our Lady of Weight Loss herself. Think before chewing, Tushkateers!!! Think! Click! Lose! As you click through “hot biscuits here,” contemplate whether it’s worth it or not! And then…send the “hot biscuits” jigsaw puzzle e-card to a friend. For more weighty wisdom join Our Lady of Weight Loss’s Kick in the Tush Club/FB!